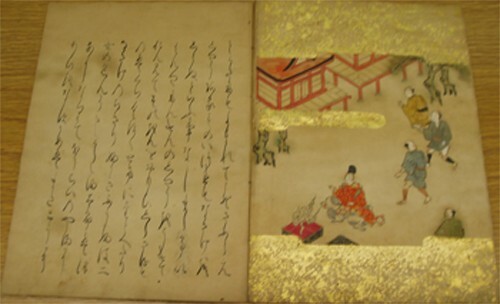 Japanese rare books collection has been gradually developed based on the initial 584 volumes of woodblock printed books donated by the Imperial Household in 1928, during Dr. Ryusaku Tsunoda's tenure at the library. The collection also holds a number of fine reproductions of important publications as well as manuscripts. Some 300 scrolls, both original and in reproduction, have been among the Library's treasures. Letters to Donald Keene from Japanese literary figures, 1952-2004. A collection of letters and manuscripts by twentieth-century Japanese authors, and first editions of Japanese literary publications, inscribed by the authors to Professor Donald Keene. Original books, pamphlets, journals, magazines, manuscripts, and ephemera produced, published and collected by Abe Kōbō. Also includes photocopied newspaper, magazine, and journal articles as well as book excerpts from Abe Kōbō's study. The Barbara Curtis Adachi Bunraku Collection, 1964-2003. This collection contains slides, photographs with corresponding contact sheets and negatives, audio and video materials, performance-related printed materials, realia objects and personal papers related to Bunraku collected by Barbara Curtis Adachi. The Makino Collection (牧野コレクション) focuses on print materials mostly related to Japanese film that were collected over the course of fifty years by former documentary filmmaker and film researcher, Makino Mamoru.